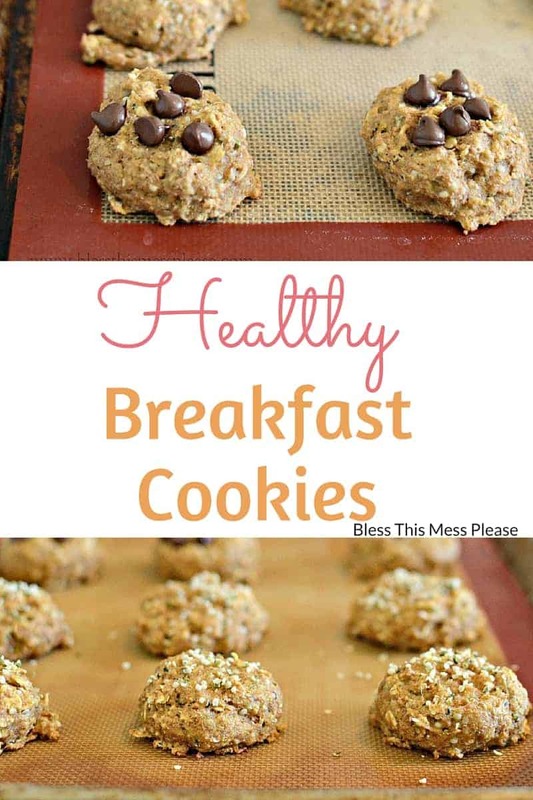 You read that title right, cookies you can eat for breakfast! Now that can’t be a bad thing. Healthy Breakfast Cookies have been on my mind for ages, and I finally got around to making some. These “cookies” are made with whole wheat flour and oats for fiber and pumpkin because that stuff is magic (and adding a veggie to breakfast is always smart). 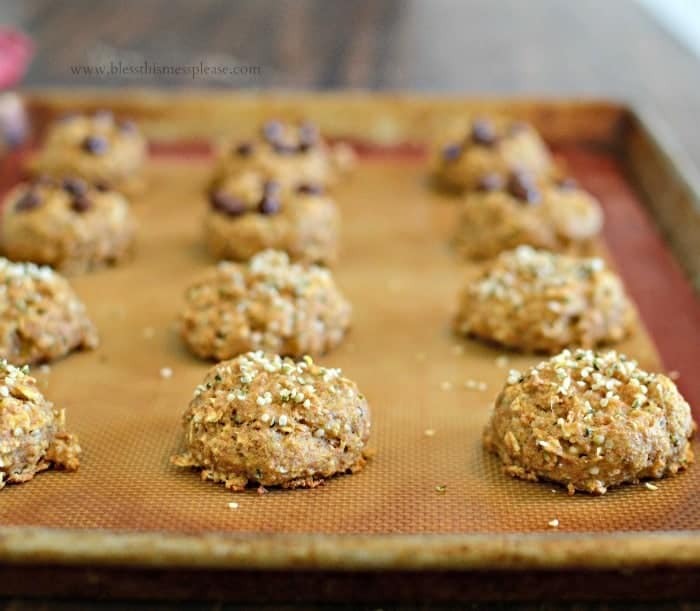 They are naturally sweetened with just a bit of honey and applesauce, and have a good amount of protein thanks to the addition of one special ingredient – hemp seed hearts! I’ve been doing a good job of counting calories, being conscious of my protein and vegetable intake, and exercising for the past month and a half in an attempt to slowly lose the baby weight that has crept on over the last 8 years (5 babies in 8 years has left me a little on the soft side, ok, very soft side). These healthy breakfast cookies are a guilt-free treat that you can enjoy morning, noon, or night. I logged them into the Myfitnesspal app and they came out at 65 calories a cookie without the chocolate chips and 75 calories with them. I’m on team chocolate and 10 calories is worth it. I highly recommend adding the chocolate chips on top, they make it feel much more like a cookie/treat. Hemp seed hearts, hemp hearts, or hulled hemp seeds are something I’ve been buying for the last 2 years to toss in my smoothies. I read an article on super foods a while back on Simple Green Smoothies that convinced me to try them. They are an excellent source of plant-based protein, fiber, and amino acids. They are a little chewy and have a great nutty flavor. A few weeks ago I worked with Lindt and Imperial Sugar for #choctoberfest and I’m finishing up that project by working with Just Hemp Foods. The product shipment was a little slow getting to me, but once it did, I got cooking! They sent me toasted hemp seeds (excellent on salads for some nutty crunch), hemp hearts, which I used here and have been putting in my morning smoothie, and some hemp protein powder and hemp oil, which I haven’t opened up yet. I’m excited to try. In a medium bowl beat together the pumpkin, applesauce, honey, and melted butter. Add the eggs and beat well to combine. Add the vanilla and stir to combine. 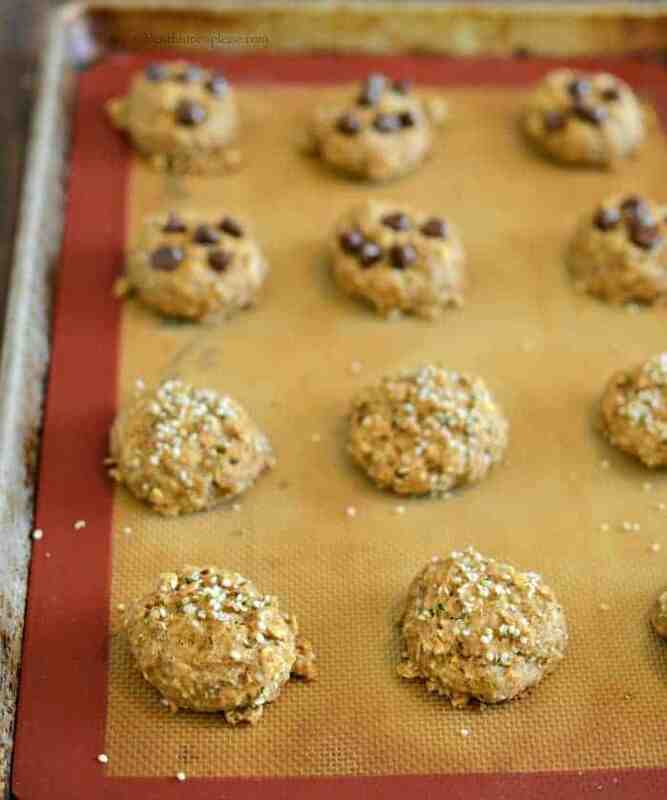 Add the flour, oats, hemp seed hearts, baking powder, soda, and salt and mix well to combine. Let the mixture rest for 5 minutes. Use a 1 tablespoon scoop to scoop out balls of dough onto the prepared baking sheet. Sprinkle the tops with additional hemp seed hearts or add 5-6 chocolate chips (gentle press them into the dough before baking). Bake for 10-12 minutes until lightly browned. Remove for the oven and allow to rest on the baking sheet for 3-5 minutes before placing the cookies on a cooling wrack. Enjoy right away or store in an airtight container for up to 3 days. I highly recommend adding a few dark chocolate chips. It really makes them feel like “cookies”. These are very lightly sweetened, so don’t expect differently. If you are looking for more of a treat, you can double the honey. I also thought these were much better fresh, so next time I’m going to halve the recipe and just enjoy them the first day or two. They travel well too! I popped a little baggie of healthy breakfast cookies in my purse while we went to town last week and munched on them instead of treats when I got hungry in the car. They also survived the lunch boxes well. 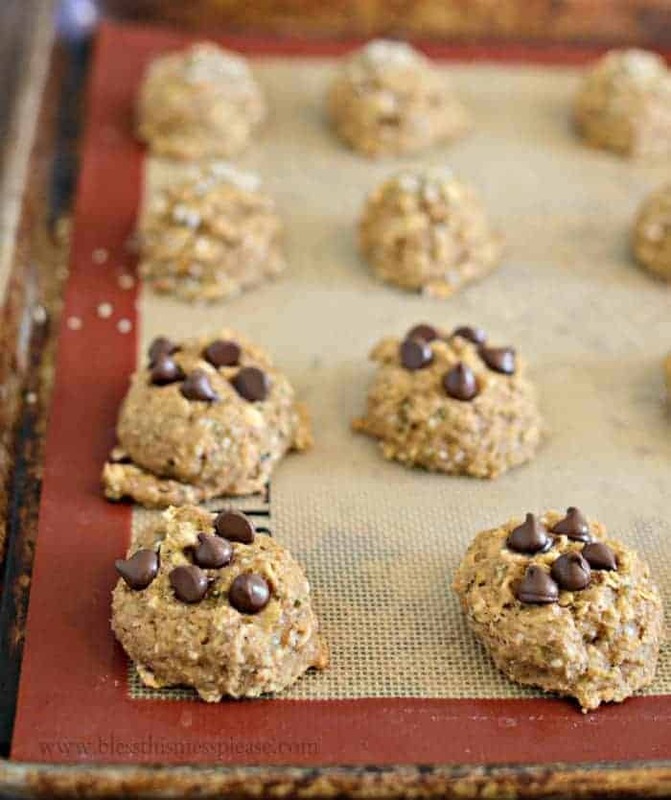 You are going to love having a healthy cookie recipe on hand that is also light on calories. These healthy no-bake cookies are also delicious for dessert! Disclosure: Just Hemp Foods sent me a package of hemp products though I was not compensated for writing this post, recipe development, or taking pictures. All opinions are my own. Thank you for supporting the brands that I choose to work with. What would be a good substitute for the hemp seeds?? Chia or flax? I have already placed my co-op order for this month and would like to bake them before! Thanks for any suggestions. You could leave them out all together or go for a little ground flax I think! 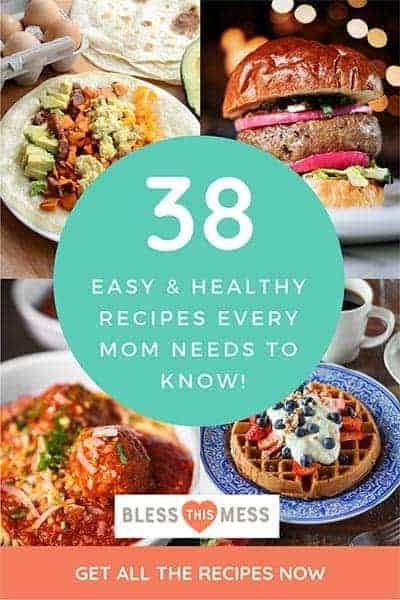 It’s up to you but I don’t think leaving them out would affect the recipe too much. Thanks so much….I will try hemp seeds soon. 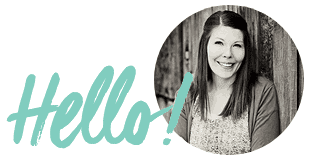 Happy new year and love your blog!